Scotch-Brite™ Wheels The industry standard and most complete selection of surface conditioning wheels provide customers with the highest level of performance and value. 3M continues to set the pace in developing non-woven wheels, as it has for more than four decades, with new and advanced technology while continuously improving its existing product line. In addition, customers are supported by 3M Innovation Centers around the world, staffed by Technical Service teams dedicated to increasing customers’ productivity, reducing manufacturing costs and helping them stay ahead of their competition. Selecting convolute vs. unitized This choice will often be dictated by the part configuration, wheel size availability, tool speed, or other fixed circumstances. Convolute is a wrapped construction on a standard sized core. The "flat" of the web becomes the cutting tool. The wheels are one directional– indicated by an arrow on the side of the wheel and arrows printed in the core. Unitized is a layered construction with a selection of center hole sizes and no core. The “edge” of the web becomes the cutting tool. The wheels are non-directional. Grade for grade– Convolute will tend to produce a finer finish; unitized will be more aggressive and durable. Density– The number may be the same (i.e. 6 density) but the unitized wheel will always act harder and be less conformable. Wheel size availability is often a factor when making this selection. Convolute wheel selection is 4"-24" diameter, 1/2"-36" wide. Exceptions depend on product type. Refer to the specific description page for availability. Unitized wheel size selection is 1/2"-14" diameter and from 1/8"-1" wide. Exceptions depend on product type. Refer to the specific description page for availability. * Buff a n dP o l i s hW h e e l sa r en o n - a b r a s i v ea n dd e s i g n e dt ow o r kw i t hc o m p o u n d s .
Designed for top performance and value on a variety of critical deburring and finishing applications. An excellent choice for deburring and polishing of all metal alloys as well as many plastics and composites. The EXL family of convolute wheel products is especially well suited for a broad range of deburring and finishing needs. The unique resin system helps to minimize smearing and the wheels show superior performance on stainless steel, titanium and high nickel alloys. Like EXL convolute wheels they resist smearing and minimize heat buildup on the workpiece. The 8 densityin E X L ,E X 2o r EX3wheelsshouldbeselected for operationsrequiring a combinationofdeburringandfinishing. There is a wide variety of densities and grades available from a very soft 2 density for applications requiring a conformable product all the way to a hard, aggressive 8 density for maximum cut and durability. EXL Roloc ™ Unitized wheels are strong and efficient for edge deburring and finishing. They perform well in a variety of metal working applications and machined parts where close tolerances are important. Changing wheels is quick and easy with Roloc TR, Roloc TS, or Roloc + holding systems. Allow for use of both the edge and surface of the wheel without interruption of mountain hardware. Mounting system is interchangeable with Scotch-Brite ™ Surface Conditioning Discs and Coated Abrasive Discs. Designed to provide a clean, safe and economical system for removing fine burrs while providing a highly polished finish. Light Deburring wheels are one of the few wheel products that are offered in convolute form only, and are widely used for fine deburring and polishing because their conformability will maintain critical tolerances while still providing a fine polished finish. 6 density in 1/2"-36" 6 density in 3/4"-36" 7, 8 density in 3/8"-36" 7, 8 density in 1/2"-36" 7, 8 density in 3/4"-36"
SST Deburring wheels are designed for deburring on stainless steel, titanium and other demanding alloys. Burrs from drilling, stamping, punching, and other machining operations can easily be removed with SST wheels. SST Deburring wheels offer the same deburring and finishing advantages as SST convolute wheels. The unitized version of the SST wheel is recommended when the application requires very narrow widths and/or small diameter ranges. Unlike some higher density products, SST wheels are somewhat softer and more conformable to suit work pieces with more intricate shapes and contours. The wheels run well on bench motors and floor lathes as well as portable power tools. SST wheels are used extensively in the aerospace industry for deburring and finishing parts as well as finishing cast and threaded products used in medical and surgical applications. Cutting and Polishing unitized wheels are long lasting and aggressive for heavy duty blending and finishing with uniform results. Layered “unitized” construction provides an excellent starting point for jobs requiring the availability of small diameters and narrow widths. Cutting and Polishing unitized wheels can often be used to replace many conventional abrasive products such as rubber bonded wheels and small set up wheels. 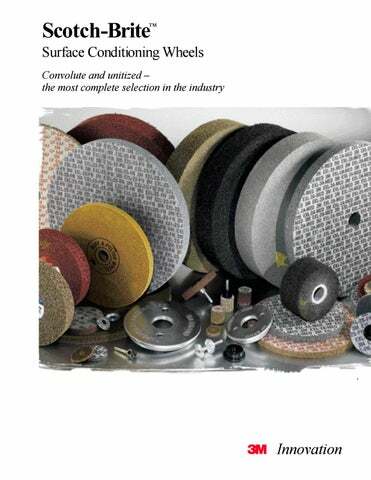 Metal Finishing Wheels are a highly conformable products that provide uniform and consistent satin/antique finishes. Offering the same unique finishing capability of Metal Finishing convolute wheels in small diameters and narrow widths. Metal Finishing wheels are used effectively to blend and match #3 or #4 mill finishes on stainless steel and to create brushed or satin finishes on cutlery. On softer metals such as aluminum, copper and brass they are used to blend out minor surface imperfections and handling marks as well as provide the desired decorative finish. Metal Finishing unitized provides durability and value for finishing of parts that are too narrow, tight or small to finish efficiently with wider width wheels. Multi-Finishing wheels are highly conformable, soft wheels that create uniform and attractive final finishes on ferrous and non-ferrous metals. They are tough enough to finish edges and welds and soft enough to final finish large surfaces. The open web construction of these wheels removes surface contamination and dirt while it resists surface loading and does not re-deposit contaminates onto the work piece. Silicon Carbide mineral offers a unique bright surface that is often desired by stainless steel fabricators. Some typical industries applications where these wheels are of value are for fine jewelry, surgical instruments, fiber optic ends, medical implants and for honing and deburring knife edges. Buff and Polish wheels are a unitized constructed, nonabrasive carrier for compounds used for polishing flat and symmetrically contoured surfaces. Often replacing felt or leather wheels, the Buff and Polish hold more compound with more even distribution allowing for faster cut and less frequent compound application. General Purpose wheels offer the greatest selection of grades, densities and mineral types. They are an excellent starting point when the application calls for fine finishing or cleaning. General Purpose wheels are easier to use that buffs and compounds and other finishing abrasives and like all Scotch-Brite products, they produce consistent results. Much like General Purpose convolute wheels, this unitized product offers a wide selection of grades and densities. Designed for applications requiring fine finishes or light cleaning, General Purpose unitized wheels are always a good starting point when the part shape or size calls for small diameters or narrow width product. An extra coarse web in a layered construction makes this Scotch-Brite™ Clean & Strip wheel a perfect choice for the removal of rust, oxides and light scale. The clean and strip wheel should also be considered for applications requiring a bright, coarse grain finish. These wheels adapt to a broad range of equipment including bench grinders and automatic finishing equipment. An extra coarse web material is converted into a variety of versatile Scotch-Brite™ Clean & Strip wheel products that provide an excellent tool for heavy duty cleaning applications. The extra coarse silicon carbide mineral combined with tough synthetic web is perfect for removing scale, rust, surface contaminants, paints and coatings. These wheels are well suited for removing weld discoloration and splatter. The open construction and aggressive properties provide a smooth running wheel that resists loading even when removing soft coatings. This wheel is a custom designed non-woven abrasive product for use on white wood sanding. The open construction and the use of garnet mineral reduces the potential for part burning. May be used in its straight form or shaped to various profiles. Tough, sharp, molded construction. Designed to remove pullouts and sharper marks on hardwood, softwood, particle board and fibre board shaped edges and moldings. Easily shaped to conform to the molding profile with excellent retention of shape. Lubricant â&#x20AC;&#x201C; Coolant Coolants, like water and some water soluble oils, reduce heat resulting in longer product life and greater cut. In the case of most oils or tallow lubricants,surface roughness can be reduced. The higher viscosity lubricants produce lower surface roughness, i.e., grease produces a finer surface finish than oil. In automatic or semi-automatic operations, it is desirable to use lubricants or coolants whenever possible. Product Hardness (Density) 3Mâ&#x201E;˘ wheels are available in a number of densities or hardnesses. Generally, the softer products, 2, 3, 4, and 5 density, are used for decorative finishing. They will conform more readily to surface contours along with generating a more uniform finish. The harder products, 6, 7, 8, and 9 density, are to be used for the more difficult blending, cleaning and deburring operations. Less than 1” 1" x All 11⁄2" x All 2" x 1⁄4"-1⁄2" 2" x 3⁄4"-1"
21⁄2" x 1⁄8" 21⁄2" x 1⁄4" 21⁄2" x 3⁄8" 21⁄2" x 1⁄2" 21⁄2" x 3⁄4 -1"
3" x 1⁄8" 3" x 1⁄4" 3" x 3⁄8" 3" x 1⁄2" 3" x 3⁄4"-1"
*Means “Dual” rating – product has a higher MOS also. 1"x 3⁄8" 1"x 1⁄2" 1"x 5⁄8" 1"x 3⁄4" 1"x 7⁄ 8"
11⁄4 "x 3⁄ 8" 11⁄4 "x 1⁄ 2" 11⁄4 "x 5⁄8" 11⁄4 "x 3⁄ 4" 11⁄4 "x 7⁄8" 11⁄4 "x 1"
1" x 1⁄ 2" x 1⁄2" 1" x 1" x 1⁄2"
3"x 1⁄2" 3"x 5⁄8" 3"x 3⁄4" 3"x 7⁄ 8" 3"x 1" 3"x 11⁄4" 3"x 1 1⁄2"
4"x 1⁄2" 4"x 5⁄8" 4"x 3⁄4" 4"x 1" 4"x 1 1⁄4"
5"x 3⁄4" 5"x 7⁄8" 5"x 1" 5"x 11⁄ 4" 5"x 11⁄ 2" 5"x 13⁄4" 5"x 2"
8"x 1" 8"x 11⁄ 4" 8"x 11⁄ 2" 8"x 13⁄ 4" 8"x 2"
10"x 11⁄ 4" 10"x 11⁄2" 10"x 13⁄ 4" 10"x 2"
12"x 11⁄ 4" 12"x 11⁄2"
3"x1⁄2" 3"x5⁄8" 3"x3⁄4" 3"x7⁄8" 3"x1" 3"x11⁄4"
5"x3⁄4" 5"x7⁄8" 5"x1" 5"x11⁄4" 5"x11⁄2" 5"x13⁄4" 5"x2"
12 Blocks Pumice 2 x3⁄4" x 23⁄4" x 53⁄4"
Overall Length x Shank Size x Washer Dia. 11⁄2" x 1⁄8" x 1⁄2"
11⁄2, 2" diameter x 1⁄4", 1⁄2" wide x 1⁄4"CH Note: 5⁄1 6" CH is recommended for wheels 6 density and harder. 2" x 1⁄4" x 1 3⁄1 6"
2, 21⁄2"-3" diameter x 1⁄4", 1⁄2", 3⁄4", 1" wide x 1⁄4"CH Note: 5⁄1 6" CH is recommended for wheels 6 density and harder. 2" x 1⁄4" x 1"
31⁄1 6" x 1⁄4" x 21⁄2"
21⁄1 6" x 1⁄4" x 3⁄4"
13⁄4" x 1⁄4" x 1⁄2" Hex Nut Dia. 11 1⁄1 6" x 1⁄8"
11 1⁄1 6" x 1⁄4"
Convolute Wheel Diameters and Standard Core Sizes Wheel Diameter 4" 6" 8" 10" 12" 14" 16" 18" 20" 24"
Standard Core Size 1" 1", 1 1⁄4" 3" 5" 5" 8" 10" 10" 12" 12"
IMPORTANT N O T I C ET O PURCHASER Product Use: User is responsible for determining whether the product is fit for a particular purpose and suitable for user’s application. Warranty and Limited Remedy: THE FOLLOWING WARRANTIES ARE MADE IN LIEU OF ALL OTHER WARRANTIES, EXPRESS OR IMPLIED, INCLUDING, BUT NOT LIMITED TO ANY IMPLIED WARRANTY OF MERCHANTABILITY, IMPLIED WARRANTY OF FITNESS FOR A PARTICULAR PURPOSE AND ANY IMPLIED WARRANTY ARISING OUT OF A COURSE OF DEALING, CUSTOM, OR USAGE OF TRADE. 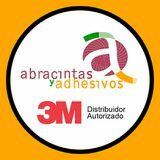 3M warrants that its ASD products will be free from defects in materials and manufacture. If an ASD product is proved to be defective, your exclusive remedy and 3M’s sole obligation shall be, at 3M’s option, to replace or repair the 3M product or to refund the purchase price of the 3M product. Limitation of Liability: Except where prohibited by law, 3M shall not be liable for any loss or damage arising from the 3M product, whether direct, indirect, special, incidental, or consequential damages regardless of the legal theory asserted, including, but not limited to contract, warranty negligence, or strict liability. Safety Information: Always use appropriate protective glasses, face shields and body protection. Do not exceed maximum operating RPM’s. Use guards provided with machine. Follow safety operation procedures posted in work areas. The foregoing Warranty and Limited Remedy and Limitation of Liability may be changed only by written agreement signed by authorized officers of 3M. E Printed on 50% recycled waste paper, including 10% post-consumer waste paper. Condicionamiento de superficie Ruedas. Convoluta y unificada. La selección más completa de la industria.